Jordan Kantor, Untitled (The Guitar Player), 2013–2014, oil on canvas, 26 x 32". Jordan Kantor works consistently with the visual afterlives of the French modernist tradition, as evidenced in his 2011 show, which included photographic reproductions of Monet’s paintings, passed through the further medium of slides. In his latest exhibition, which includes painting and collage, it is Manet whose work lingers in the wingsparticularly his 1867 self-organized exhibition that was subjected at the time to charges of absurd eclecticism (the gallery invitation alludes coyly to Manet’s “Anevue de l’Alma” exhibition, printed in the same design and featuring the word “tableaux”). 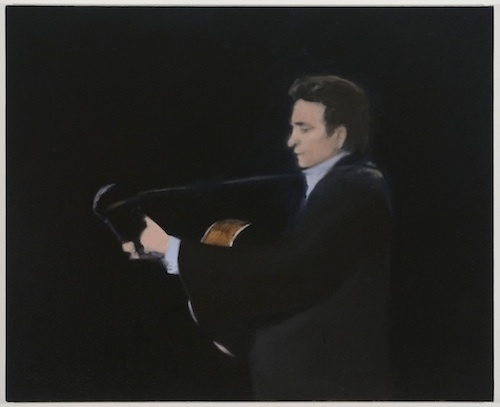 Kantor engages with Manet’s paintings both explicitly (in Untitled [Boy with Pitcher, After Manet], 2008–2013) and implicitly: Untitled (The Guitar Player), 2013–2014, depicts a seemingly televised shot of Johnny Cash, recalling Manet’s Spanish Singer, 1860. Yet it is less an outright pastiche of the Frenchman’s imagery than a channeling of his irreverence; a probing of what his figurations might mean in a world saturated by visual reproductions. Painting takes pride of place here, both in large and small-scale works. The commedia dell’arte diamonds in Untitled (Harlequin Abstraction), 2007, gesture to the Untitled (Clown Dance), 2012–2013, which in turn echoes—in its spare simplicity and murky background—the figurative simplicity of a dozing train conductor in Untitled (Paris, Sleeping), 2014. With its lingering glimpse of an old film segment, the crisscrossed pattern of Untitled (Film Leader, Partie), 2010, conjures up the harlequin motif, while also alluding to the dawn of cinema, and its unprecedented activity on the French avant-garde. In a related vein, a wall of eighteen collages finds disparate photographic imagery pinned to cardboard panel, featuring all manner of photographic sources—from African statuary to a disco ball—in varying degrees of graininess and blurriness; some of these appear adapted to painted representation, as in the prone body of Untitled (Neighbor), 2012–2013, with its flamboyant costume and nearby pumpkins conjuring, in turn, the clown motif with which the exhibition opens. Kantor’s exhibition refuses any immediate classification: If a conceptual thread unifies the images on display, its filament appears productively tangled between multiple works.